Since new ownership in the spring of 2014, the Showcase Team has continued to make strides in trends with more than $20 million in sales, as well as building the brand as one of the top real estate leaders in the Ocala/Marion County area. As one of the top 25 teams of 2015, designated by the Ocala/Marion County Association of Realtors, several Showcase agents were recognized for their achievements. With a re-launched website, an in-house marketing team, and an advertising strategy that includes print, TV, radio, Internet and social media campaigns, the Showcase Properties Marketing efforts are strategic and comprehensive for all buying and selling needs. We are also excited to announce our NEW LOCATION! Our offices are now currently located just south of Ocala Breeders Sales and the Ocala International Airport, next to the Marion County Farm Bureau office. Our new 6,000 sq. ft office is convenient to not only equine commerce, horse farms and training facilities, but also to award-winning restaurants, shopping, hotels and travel amenities. Additional office rental space is available at this location on a limited basis. And finally, we would like to announce Carol Krokel as our latest addition to the Showcase Team of agents. Reach out to Carol with any real estate needs for buying or selling at 352-216-9322 or via email. The January report is available from the Ocala Marion County Association of Realtors (OMCAR) report. Please email our office for the report. If you would like to have information regarding the sale of horse farms, or agricultural land in general, please contact us. According to RealtyTrac’s first quarter 2015 Residential Property Rental Report, Marion County was one of the top Florida markets for single-family residential real estate investments and 12th overall in the nation. The study broke out potential top markets by generation and also included a list of U.S. markets where rents increased by at least 10 % year-to-year, as well as “safe havens” – markets where economic conditions make real estate investment relatively safe. According to RealtyTrac, “safe-haven” rental markets for investors are areas that have an unemployment rate below the national average of 5.6 % and annual rental returns of 10 % or higher. 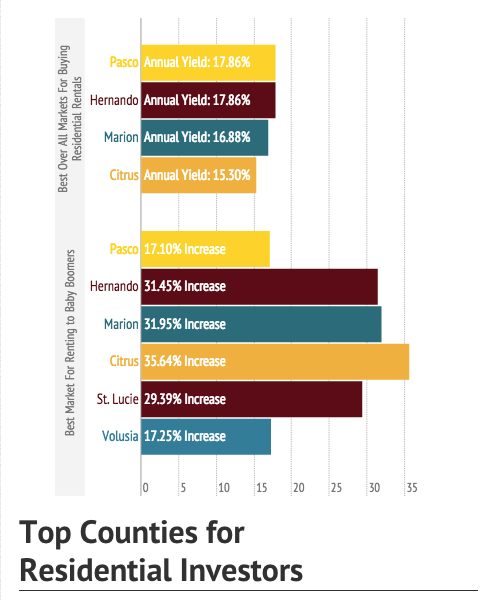 Only one Florida county made the top 10 in that regard: Broward County, with an annual gross yield of 13.10 %. Showcase Properties of Central Florida has an extensive list of single-family residences for sale in the Marion County area. You can browse our residential real estate listings here. When selling a home, you want to get the best price possible for how quickly you need to sell. However, many sellers often miss the mark due to one major mistake: failing to properly prepare and stage their home to sell. Buyers begin to assess your home from the minute they step out of their cars. Make the front of the house neat and fresh-looking. Painting the front door and decorating the front porch or patio are easy ways to start off on the right foot. Pay attention to the attractiveness of your outdoor space. Freshen up your yard by trimming hedges, edging the lawn, placing fresh mulch and adding a few potted plants or flowers. Pressure washing the driveway and walkways are also an easy way to brighten up the first things potential buyers will see when they come to view your home. Clutter can detract from any interest a buyer might have had. Clutter prevents the buyer from seeing the home’s true potential and true space, making the home seem small, reducing its appeal. Remove as much as possible from the floors, bookshelves, countertops, closets and cabinets – don’t forget that buyers will be opening cabinets and closets to check storage space. Renting a storage unit in order to maximize space in your home might be a good option. Dramatic wine-colored dining room walls and bright blue bathroom walls might be colors that you love, but they might also be a turn off for potential buyers. Bold and bright paint colors draw more attention to your taste in paint colors and less attention to the size of the room or the beautiful hardwood floors. Instead, take the time to repaint those walls with neutral tones, such as different shades of tan or off-white. Opinions differ on the level of personalization to keep when staging a home. Removing every single picture of your family is not necessary, however, crowded mantles, walls and bookshelves filled with pictures and trophies can be distracting. As with de-cluttering your home, try keeping the personal items to a minimum. Make sure to dust, mop and wipe down all surfaces. The bathrooms and kitchen are the most important areas to keep clean. Remove any stains that could deter buyers, whether on your carpet or in your bathroom areas. Be sure that the bathtub is also clean and organized – buyers won’t be afraid to pull back the shower curtain to take a look. If you have been procrastinating about fixing that leaky faucet or broken door hinge, procrastinate no longer. Small repairs in the home can make a big difference to buyers. Give yourself ample time to make repairs, changes and to clean your home. Selling your home can be a stressful time, and rushing to get your home ready will make it even more challenging. It’s also important to prepare yourself emotionally – just as your home soon will no longer be your home, it’s also on its way to become someone else’s home. Try not to take buyer criticisms personally. If you live in the Ocala and Marion County area and you’re considering selling your home, our team at Showcase Properties offers comprehensive services in helping you successfully through the process. Our real estate agents combine expertise – including successful experience in staging homes to sell – with a thorough knowledge of the market to get you the most value when selling your home. Click here to learn more about successfully staging your home to sell. Referrals are the livelihood of our business. If you have a friend, family member, or co-worker who would benefit from the Showcase Team’s real estate services, please contact us. We promise to treat everyone with respect and the highest level of integrity and customer service. Your referrals are the greatest compliment that I, and the Showcase Team, can receive. Thank you for your business and recommendations!